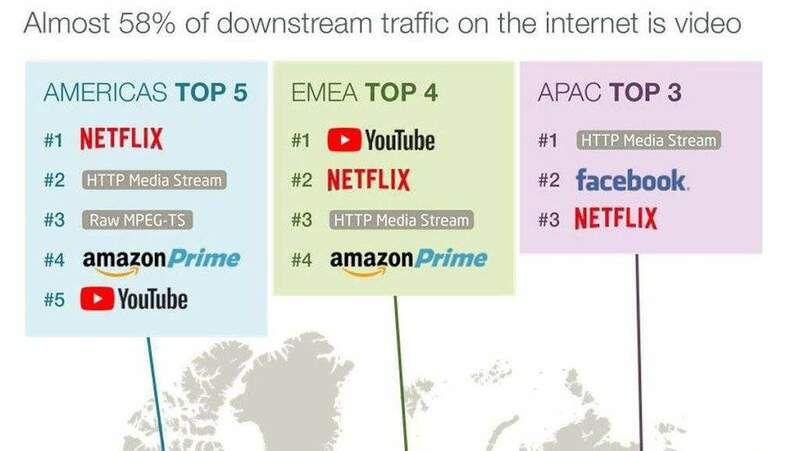 According to the recent study “2018 Global Internet Phenomena Report” by the American-Canadian company Sandvine, Netflix was able to overtake YouTube in downstream data worldwide despite providing paid vs free content. The snapshot below (which was taken from the report) shows that Netflix holds the top spot in the Americas. In EMEA, YouTube is still number one, with Netflix in second place. In APAC, Netflix ranks third, after Facebook. 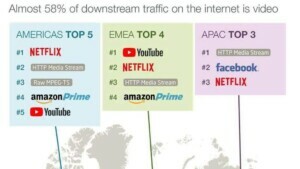 Furthermore, Netflix is also number 1 in global downstream traffic with about 15% share. In the Americas, that is even 19.1%. With a total of 26.6% in global video traffic, Netflix ranks first place, followed by HTTP streaming with 24.4% and YouTube with 21.3%. In general, the study found that video streaming accounts for 57.7% of all Internet traffic, which is an important indicator for marketing professionals and advertisers. In second place are download from the web (17%), gaming (7.8%) and social media (5.1%). Amazon Prime Video ended in 5th place (5.7%). The results are based on interviews with 150 service providers worldwide, representing 2.1 billion subscribers.